The repository can be used to build MicroPython for modules/boards with SPIRAM as well as for regular ESP32 modules/boards without SPIRAM. As of Sep 18, 2017 full support for psRAM is included into esp-idf and xtensa toolchain. Building on Linux, MacOS and Windows is supported. MicroPython works great on ESP32, but the most serious issue is still (as on most other MicroPython boards) limited amount of free memory. ESP32 can use external SPI RAM (psRAM) to expand available RAM up to 16MB. ESP-WROVER-KIT boards from Espressif, AnalogLamb or Electrodragon. ESP-WROVER from Espressif, AnalogLamb or Electrodragon. S01 and L01 OEM modules from Pycom. It is huge difference between MicroPython running with less than 100KB of free memory and running with 4MB of free memory. Some basic documentation specific to this MicroPython port is available. It will soon be updated to include the documentation for all added/changed modules. Some examples can be found in modules_examples directory. This means the regular esp-idf menuconfig system can be used for configuration. Besides the ESP32 configuration itself, some MicroPython options can also be configured via menuconfig. This way many features not available in standard ESP32 MicroPython are enabled, like unicore/dualcore, all Flash speed/mode options etc. No manual sdkconfig.h editing and tweaking is necessary. MicroPython build is based on latest build (1.9.2) from main MicroPython repository. ESP32 build is based on MicroPython's ESP32 build) with added changes needed to build on ESP32 with SPIRAM and with esp-idf build system. MicroPython can be built in unicore (FreeRTOS & MicroPython task running only on the first ESP32 core, or dualcore configuration (MicroPython task running on ESP32 App core). Internal filesystem is built with esp-idf wear leveling driver, so there is less danger of damaging the flash with frequent writes. File system parameters (start address, size, ...) can be set via menuconfig. Native ESP32 VFS support is used for spi Flash (FatFS or SPIFS) & sdcard filesystems. Built-in ymodem module for fast transfer of text or binary files of any size to/from host. Uses the same uart on which REPL runs. Btree module is included, can be Enabled/Disabled via menuconfig. Eclipse project files are included. To include the project into Eclipse goto File->Import->Existing Projects into Workspace->Select root directory->[select MicroPython_BUILD directory]->Finish. After opening, rebuild the index. Xtensa toolchains for Linux, Windows and MacOS and esp-idf are provided as tar archives. They will be automatically unpacked on first run of BUILD.sh script. You can use -jN (N=number of cores to use) to make the build process faster (it only takes les 15 seconds seconds on my system with -j4). If using too high N the build may fail, if that happens, run build again or run without the -j option. The board stays in bootloader mode. Run your terminal emulator to connect to the board and reset the board. You can also run ./BUILD.sh monitor to use esp-idf's terminal program, it will reset the board automatically. Included BUILD.sh script makes building MicroPython firmware easy. As default the build process runs silently, without showing compiler output. You can change that by adding verbose as the last parameter to BUILD.sh. After the successful build the firmware files will be placed into firmware directory. flash.sh script will also be created which can be used for flashing the firmware without building it first. SPIFFS filesystem can be used on internal spi Flash instead of FatFS. Prepared image file can be flashed to ESP32, if not flashed, filesystem will be formated after first boot. Copy the files to be included on spiffs into components/spiffs_image/image/ directory. Subdirectories can also be added. W (36) rtc_clk: Possibly invalid CONFIG_ESP32_XTAL_FREQ setting (40MHz). Detected 40 MHz. I (1812) spiram: PSRAM initialized, cache is in low/high (2-core) mode. I (1834) cpu_start: Pro cpu up. I (4777) cpu_start: Starting scheduler on PRO CPU. I (2920) cpu_start: Starting scheduler on APP CPU. FreeRTOS running on BOTH CORES, MicroPython task started on App Core. Last edited by loboris on Tue Oct 24, 2017 7:10 pm, edited 5 times in total. Additional information may be available on ESP32 Forum. Last edited by loboris on Tue Oct 24, 2017 2:41 pm, edited 1 time in total. That sounds like a major achievement. Can you tell more about how a psRAM build works? How does heap allocation "decide" between internal RAM and psRAM? Is bytecode preferentially assigned to RAM? Has performance been quantified compared to a build using internal RAM only? At this time the complete MicroPython heap is allocated on psRAM. Operations from psRAM are slower then from internal RAM, as it is accessed over SPI interface, with cache in internal RAM (32KB if I remember well). So, if we are operating with the data already in the cache, the speed will be the same. If the new block of data has to be placed in cache,there will be a delay. It works the same way the SPI Flash is accessed. I've done some simple tests, keep in mind that for now I couldn't enable psRAM operating at 80MHz (only with MicroPython, it works with esp-idf applications) and that the psRAM support in eps-idf is at very early stage (not even officially supported yet). Note the small difference with small amount of data. With 80Mhz psRAM clock the times should be half of the measured values. My measurements with simple memset function (on 2MB block allocated on psRAM) in esp-idf based application shows that the speed is ~7.5 MB/s with 40MHZ psRAM clock and ~14.3 MB/s with 80MHz psRAM clock. How does heap allocation "decide" between internal RAM and psRAM? There is a configuration option → Component config → ESP32-specific → Capability allocator can allocate SPI RAM memory (CONFIG_MEMMAP_SPIRAM_ENABLE). This option is checked in app_main() in main.c to decide if psRAM can be used, see main.c for detailes. I think all this is very promising, we jus have to wait a little for full esp-idf support and modules availability to take full advantage of ESP32 with psRAM capabilities. Of course, MicroPython itself could/should be optimized to work with psRAM. Impressive, especially when you get 80MHz working. Not exactly half the time, but significant improvement (~63%). I (1726) cpu_start: PSRAM initialized, cache is in even/odd (2-core) mode. I (1749) cpu_start: Pro cpu up. I (3462) cpu_start: Starting scheduler on PRO CPU. I (1683) cpu_start: Starting scheduler on APP CPU. The MicroPython firmware is now built as esp-idf component. menuconfig can be used for ESP32 configuration as well as for configuration of some MicroPython options. The repository can be now used to build MicroPython for modules with psRAM as well as for ESP32 modules without psRAM. Standard esp-idf and Xtensa toolchain can be used if building without psRAM support. micropython is no longer submodule, it's core is based on latest build (1.9.1) from main MicroPython repository, with some modifications needed for the new build system. All ESP32 working modes (unicore/dualcore) and speeds, as well as all flash/psRAM speeds and modes are supported. BUILD.sh script improved with more build options. The repository README-md is updated with new information. Last edited by loboris on Sat Jul 22, 2017 7:49 pm, edited 1 time in total. Both the board and the work you've done look awesome You might want to tell Adafruit about it given that they sell the board and support MicroPython. Good news for everybody wanting to work with ESP32+psRAM. 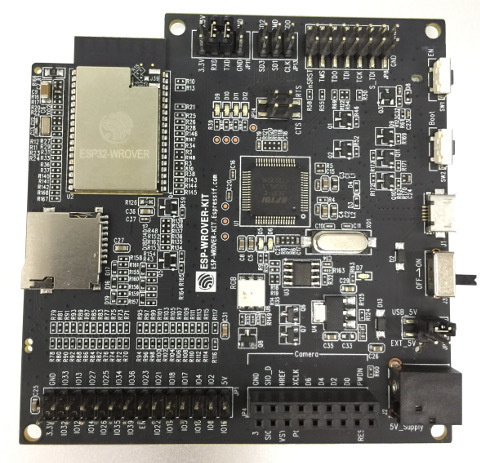 AnalogLamb is offering ALB32-WROVER module with 8MB Flash and 4MB psRAM in ESP-WROOM-32 footprint package. Available for pre-order, will be released on August 8, 2017. Interesting. I'd assumed that the Adafruit/Espressif boards had psRAM but looking at the schematic https://dl.espressif.com/dl/schematics/ ... _SCH-3.pdf I can't see any. An unfortunate omission. AAMOI why the ESD protection diodes on the SD card connector? Is there a possibility of hardware other than an SD card being plugged in?